The global market for adhesive is demonstrating a highly competitive business structure, especially in emerging economies, finds a new research study by Transparency Market Research (TMR). With a large pool of players, the completion within this market is likely to remain high over the next few years. Havells, Huber+Suhner AG, General Cable Corporation, Lumberg Connect GmbH, ReneSola Ltd., Atkore International Group Inc., Taiyo Cable Tech Co. Ltd., Prysmian Group, Ram Ratna Wires Ltd., Allied Wire & Cable, and Lapp Group are some of the key companies in this market. These players are focusing on regional expansion to strengthen their positions, states the research report. The research study states that the global solar cable market was worth US$0.46 bn in 2015. Expanding at an impressive CAGR of 14.10% during the period from 2017 to 2025, the market is projected to reach US$1.64 bn by the end of the forecast period. Copper cables and aluminum alloy cables are the two main products available in this market. These solar cables find extensive application in the residential, industrial, and the commercial sectors, reports the market study. 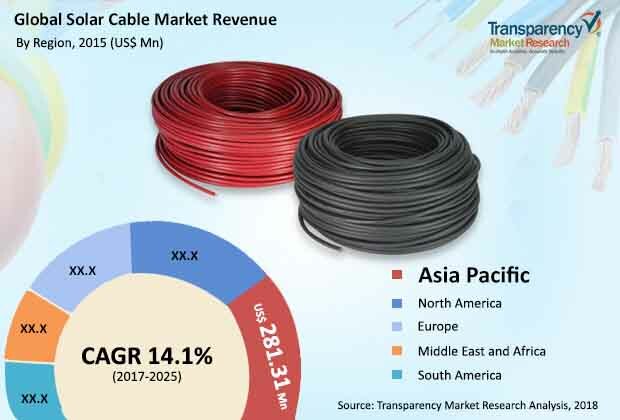 In terms of the region, North America, Europe, Asia Pacific, the Middle East and Africa, and Latin America have been considered as the key regional markets for solar cables in this research study. With a revenue US$281.31 mn, Asia Pacific dominated the global market in 2015. This regional market is anticipated to remain on the top position throughout the forecast period, owing to the increasing investments and initiatives by the government of the People’s Republic of China and various players for the development of clean energy. North America is also anticipated to witness a considerable rise over the next few years, states the research report. “The increasing support from various governments in encouraging the uptake of solar energy methods is the key driving force behind the growth of the worldwide market for solar cables,” says an analyst at TMR. The continuous improvement in the quality of cables, in order to make those resistant against adverse climatic conditions and UV radiations and highly effective in transferring energy, and the rising awareness level of the urban population about their contribution to the environment by taking up solar energy are likely to support this market in the years to come, states the research study.